I showed you in a recent posting about the living-mulch problem in the Tomato Patch—thousands of seeds that had sprouted after I put down straw mulch. I asked readers to send suggestions for solving the problem. Let me tell you about their recommendations (edited for blog length) and then explain what I did. Major recommendations, then, were to pull it, cut it, or smother it. Step 1: I decided not to cut the weeds. Kent P. mentioned the possibility that some of the weeds were not grain but invasive grasses, and I had noticed that some young weeds didn’t look like grain seedlings, so I wanted to be sure to kill them. Step 2: I started pulling the weeds but quickly saw the manual approach resulted in lots of roots staying in the soil with great potential for resprouting. I then switched from hand to my Cape Cod weeder to easily uproot the thickly growing weeds and to knock most of the soil off their roots. In the process I tried to pull out most of the straw mulch, but it was so intertwined with the weeds that I tried to cure the mix by putting most of it in a windrow on an adjacent sidewalk, hoping the heat and sun would kill the weeds. 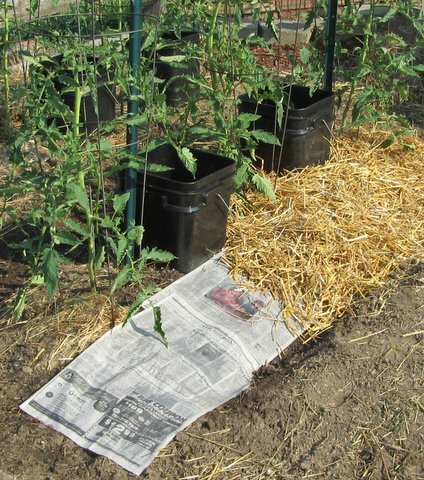 For a day and a half I occasionally turned the “curing” mulch with a pitchfork to expose still-green weeds to the sun. Step 3: I smothered still-to-sprout weeds by again laying down sheets of newspaper—until I ran out about halfway through the job. I would have used cardboard in the walkways—if I had some. 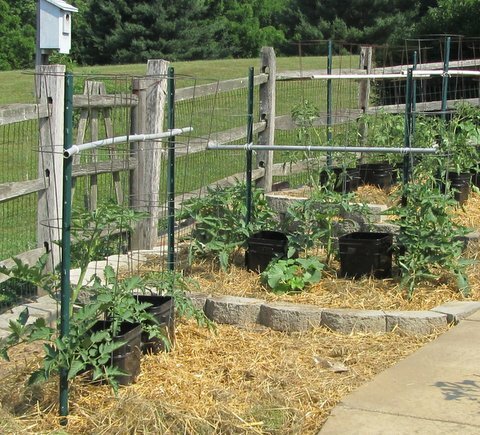 I plan to collect some next winter for use in Tomato Patch 2013. 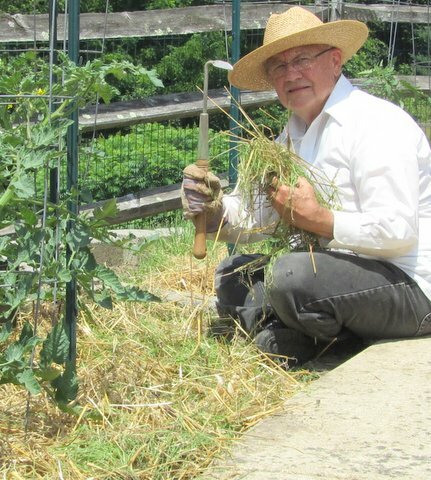 Step 4: I bought another bale of straw at a local farm to top off the re-mulched Tomato Patch. In a future blog I’ll share some things I’ve learned from my encounter with living mulch. In the meantime, thank you, readers, who sent recommendations from near (Maryland and West Virginia), far (California), and around the world (Australia). If you wish to read my earlier posting about my living-mulch problem, CLICK HERE. All’s well, I hope, as temperature hits 97 degrees F.
Good job Bob!! Know this was a job and a-half for you. Hope you licked the problem and it won't resurface in 2013! Also, hope you have a bountiful supply of tomatoes to reward you for your efforts!! Looks goods. Amazing how couple of sheets of newspaper cure a lot of weed issues. I used this technique in a couple of places in my flower garden this year. 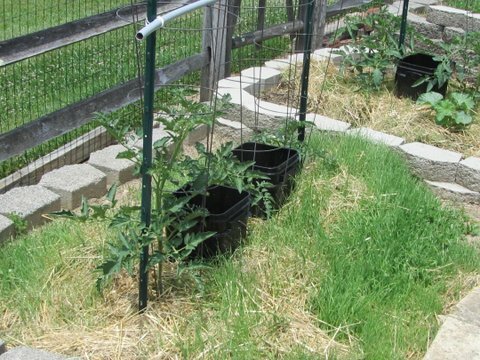 Also, if you would like some red plastic mulch for next year, I can guarantee its weed free and tomatoes are suppose to ripen several days earlier because of the reflection from the red plastic mulch. I use grass clippings from my lawn to make my own hay. It works great in my vegetable garden. 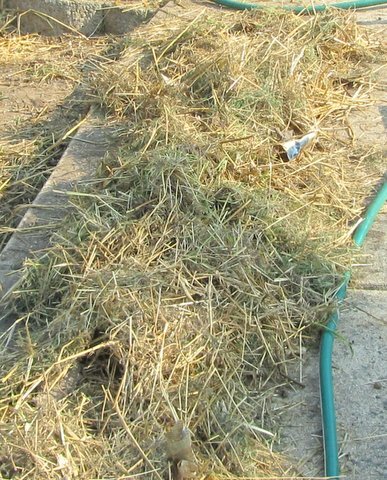 It is more dense and smothers weeds better than straw.